To explain simply, Yantras are basically figures drawn with geometrical lines to symbolize the basic energies present in our universe. To put it a bit more explicitly, Vedic Yantras are primarily the graphical illustration of Mantras. Yantras are drawn, imprinted or decorated on a range of materials. The classical 8 surfaces that have been used to draw Yantras are gold, silver, copper, crystal, birch, bone, hide, and the Vishnu stone. 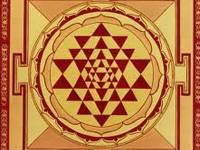 Vedic Yantras are intended to get rid of the afflictions and achieve a desired outcome. The Yantras are inscribed with the spiritual writings of the afflicted beneficial planets at a distinct lucky time to benefit the person who is going to wear it. The Yantras are to be looked at everyday in the early hours of the morning, and the person is also supposed to light an incense stick before the Yantra every day. This routine brings good luck to the person and blesses him/her with accomplishment and prosperity. It is important that the Yantra is prepared and shaped by a capable individual as well as used under his precise directions for productive results. As a matter of fact, a Yantra would be totally useless if it is not created by a capable person and then ‘infused’ with the specific energy via the medium of mantra. A Yantra worn this way can be hugely beneficial for any individual in every field of your life, i.e. to be successful in profession, to earn wealth, to keep away diseases etc. By having a Yantra at home and placing it in a sacred place in the house, any individual can benefit a lot by looking at it and praying before it everyday. There are various kinds of Yantras made for fulfilling various kinds of purposes. They can aid in achieving success in life, bringing a person under control, bringing wealth and prosperity as well. Yantras energized during the nights of Maha Shivratri, Holi and Diwali are most effective and powerful. Normally, the individual is also advised to chant the related Mantras in the presence of the Yantras for achieving fast results. Below is the list of some of the popular Yantras being used by people at home.